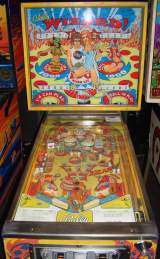 Coin-op Pinball published 44 years ago by Bally Mfg. Released in May 1975. 10,005 units were produced. Wizard was inspired by the 1975 Hollywood movie 'Tommy' and included likenesses of Roger Daltry and Ann-Margret on the backglass.